Seahawks mailbag: What about Michael Bennett’s future and the team’s 2018 draft strategy? Questions about the future of Michael Bennett and how the team should approach the 2018 draft in our latest Seahawks mailbag. A: This is a tough one this time of year before we know what has transpired in free agency — perceived needs could change greatly by the time the draft rolls around April 26-28. But I also think this year, as much as any since 2012, is when the Seahawks truly may need to go with the best player available. As our mock draft roundup posted this week revealed, draft experts have made the case that safety, cornerback, defensive line, offensive line, running back and receiver could be needs for the Seahawks. Throw in tight end — which could be a barren spot for Seattle by the time the draft rolls around — and virtually everything but quarterback and middle linebacker could be viewed as a need for the Seahawks. One could also argue that going with the best player available has been when the current Seahawks regime has been at their best in the draft room. That’s how the Seahawks did it from 2010-12 — remember all the criticism for taking Russell Wilson where they did because they had just signed Matt Flynn and quarterback didn’t seem to be a priority? — when most of the players key to the team’s Super Bowl run in 2013 were acquired. And though general manager John Schneider has resisted the idea that the Seahawks have varied from that strategy since, some of their early picks the past few years have seemed targeted at specific positions — taking two receivers among the top four picks in 2014 after losing Golden Tate in free agency and releasing Sidney Rice, for instance. So maybe forgetting about priority and just letting it rip would be Seattle’s best strategy this year. A: I don’t think judging Bennett (or any interior defensive linemen) by solo tackles is the best way to go, because often a linemen’s job is to create penetration and disrupt things and let the linebackers and safeties clean up. 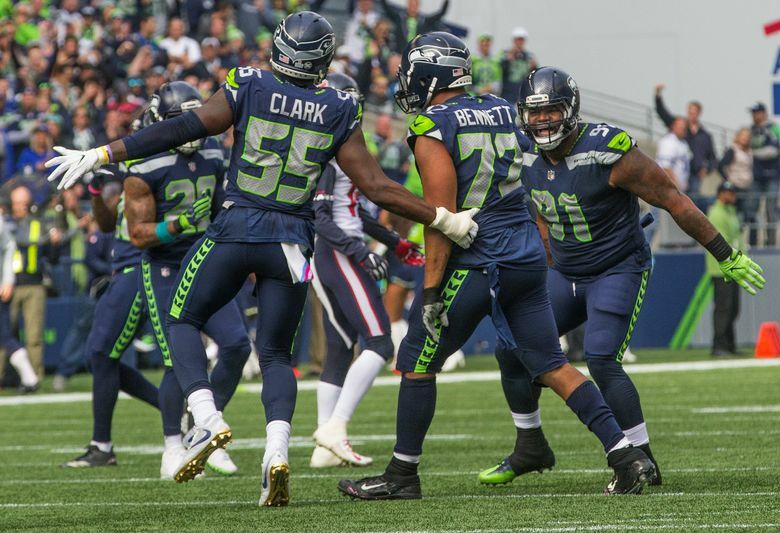 But if you want to use numbers to judge Bennett’s play, better ones are the 24 quarterback hits he had — tied for 10th in the NFL, best on the Seahawks and more than players such as Joey Bosa and Von Miller — and his 8.5 sacks, second-most on the team behind Frank Clark. Maybe Bennett’s season was a tick behind his 2016 campaign. But he still made the Pro Bowl and was one of Seattle’s most productive and reliable players (his 931 snaps were the most of his Seahawks career despite battling knee and foot injuries, as was his 84.8 percent of snaps played). Bennett’s future with the Seahawks, though, is in question, which we know mostly due to his comments at the end of the season, when he several times said he wasn’t sure if he’d be back in 2018. Cutting Bennett, though, wouldn’t do Seattle a ton of good financially — releasing him before June 1 would save just $2.1 million while counting as $5.2 million in dead money. A post-June 1 cut would save $5.6 million with a $1.7 million dead-money number. That would give Seattle some flexibility during the season and with extensions, maybe. But you’d still have to figure out how to replicate his 2017 production. Bennett obviously has been one of the team’s most outspoken players — on the field and off — and the team could decide that rebooting would mean needing to change the leadership in the locker room. That could be as big of a factor as anything in the team’s decision on Bennett. As for Schottenheimer, it hardly needs to be said that the team is hoping he will reinvigorate the running game. Exactly how he plans to do that we have yet to hear — no one from the team has spoken publicly about the coaching changes. But no doubt, reviving the running game will be Job No. 1 for the new offensive coaches in 2018. As for predicting how well he’ll do that? I think we still need a bit more info — who are the running backs going to be, what kind of scheme changes do they plan to make? — before offering a whole lot of projections.